Nearly half of all people in their 60s with debts continue to work, compared with only one-third of those who have no debt. Mortgages seem to have a greater influence on their decisions than credit card bills or other consumer debt. At age 64, for example, more than two-thirds of homeowners with mortgages still work, compared with just over half of homeowners who’ve paid them off. The researchers contend that rising debt levels are changing the U.S. retirement landscape. It would be interesting to study the other housing choices people can use to solve the debt problem. – How many are able to downsize while extinguishing mortgage debt? – Can they do so and remain in their same community or at least, nearby? – Is housing so expensive in their area that even downsizing requires relocation? – To what degree are tighter lending standards hindering downsizing for those who still must carry a mortgage? Perhaps most important: Will developers and planners recognize the need to provide for affordable senior housing choices? Choices within the general community are needed, not just new tract houses in the suburbs for those 55+. Yes that would be interesting! Also, one of my colleagues, an economist, who read about this research wondered whether people with a stronger taste for work are simply more likely to borrow more. Or perhaps there are other reasons for the differences in borrowing levels. 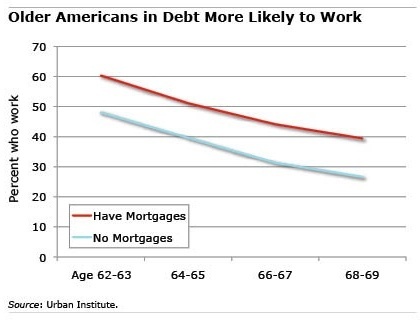 We’re definitely seeing this in our user base: the boomers were/are more comfortable with debt (they have more of it), so as they move into the retirement phase, the average amount of debt we see per household is rising. Thankfully, there are employers who view older workers favorably. They can be more loyal, dependable and patient compared to younger, less experienced workers. If you’re eligible for Medicare, not needing an employer health plan may help make you be a more attractive job candidate. Self-employment is an alternative that some may be able to explore. If one spouse is still in the workplace, or if you’re able to supplement self-employment earnings with Social Security, it may be worth a try. It may even be a more satisfying option. Being in the over 50 club myself, with still owing a mortgage, it does delay retirement. If we didn’t have one, we could relax and just budget the utilities. But owing on a mortgage, we are faced with making life decisions on whether to keep the home or let it go earlier than paying it off. It can be a very stressful decision because rent is out the roof and the thought of having to move and possibly having to move again if your rent goes up, is what keeps us working. This is a terrific article and a great example of why I follow this blog. From my observations as a licensed mortgage professional, I can attest to the findings and concur that the days of retiring at a decent age are long gone for most. The point Delores brought up in her comment is key as well; citing that older people in the workplace are often ‘forced’ out, thereby pushing them into retirement sooner. The truth of the matter is that while I’m sure some employers may practice age-based discrimination, most just higher the younger applicants because they a) have more current technological training and skills or b) require less pay. The great thing about America is that if no one wants to hire you, there’s almost nothing to stop you from starting your OWN business. Don’t let the workplace dictate your future, take it into your own hands. -Go multifamily – Did you know that it is possible to own a multifamily home and live practically for free by renting out the vacant areas? There ARE options, but people need to reach out and contact their financial and mortgage professionals to get the appropriate game plan together! This article and the findings are “spot on” with what many of us are facing, particularly after the Great Recession. Many of us were forced to modify our mortgages to stay above water, but this left us with longer term mortgage debt that will still remain long after we turn to worm dust. This is why we have to reinvent what retirement means and why I created a website to promote this concept and profile seniors who have found a fulfilling and satisfying working life in their “retirement.” It’s a new day folks!